David Bottini holds a BA in Fine Art and an MFA in painting. His work has exhibited in numerous state and national exhibits. He earned the title “Master Teacher” during his time as the former Visual Art Department Chair at a national top-tier prep school in the DC area. His involvement in the arts community has included three years on the Teacher Advisory Board of the National Gallery of Art in Washington and as Museum Liaison and Chair for Kids-In-Design, a group of volunteer design professionals working with school and community organizations in Baltimore. His work as a painter and a freelance designer has included local & regional exhibits, painting workshops, adult classes, and teaching as an adjunct college faculty member. 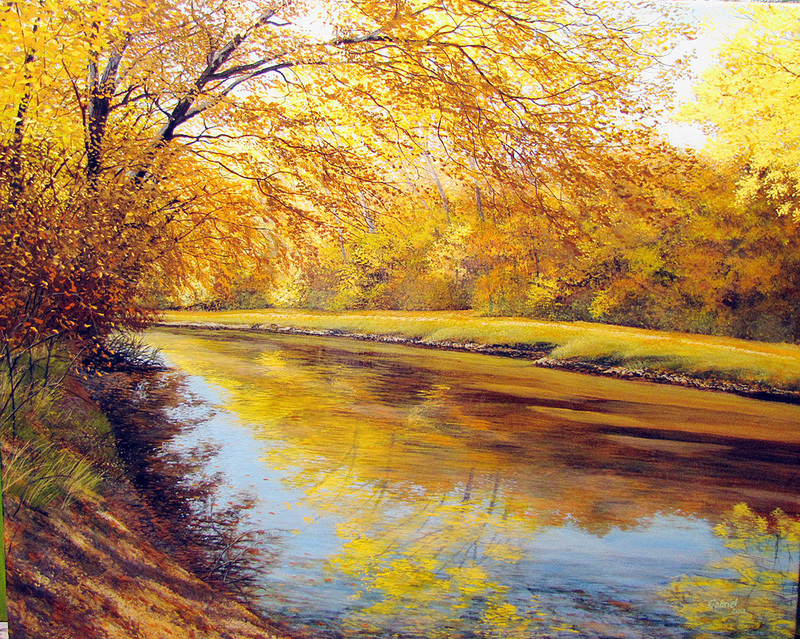 His last 20 years remain focused on his passion for landscape and atmospheric effect. He works in and around the Washington DC/Baltimore region, Florida, and in Central Pennsylvania. David lives in his native Pennsylvania amidst the scenic hills and farmland of the Susquehanna Valley in Central PA. The light, the colors of the fields and the great variety of terrain and atmospheric effects in this river valley furnish endless awe and subjects for artistic study. He uses the painting signature "Gabriel" as a dedication to the enduring affects of his Italian grandfather (Gabriel Bottini) on his interest in nature and appreciation of the world around him. His landscapes are signed Gabriel with David's signature on the back of each work. 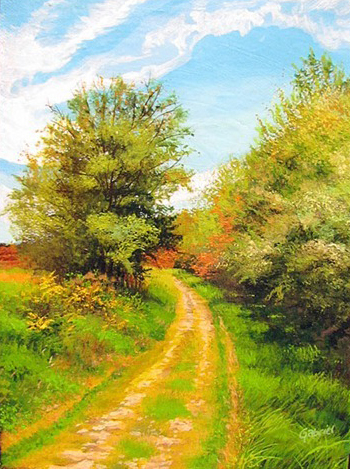 David’s work is in private and corporate collections throughout the United States. 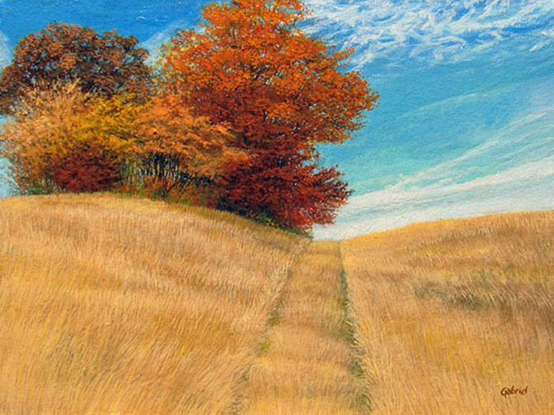 David’s paintings narrate a personal journey where a solitary moment is captured in time and stored in memory, a glimpse of the path that leads just beyond your mind’s-eye view. Where a ragged trail, a sideway glimpsed view, a view through forest toward a distant vista, or a weather worn pasture caught in a breeze capture your interest and become frozen in memory. He strives to make a viewer aware of a fleeting moment of solitude in nature where nature’s quiet and environmental elements create a lasting impression of a specific & personal place and time… the romanced image of a cherished memory. 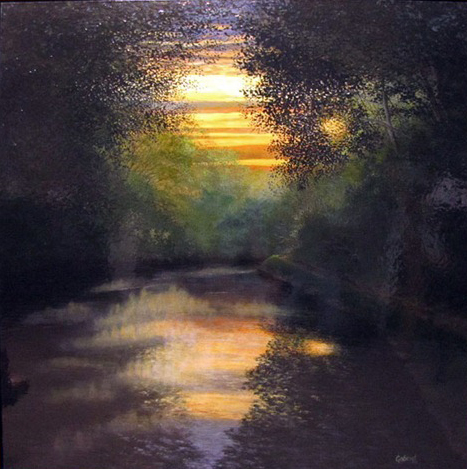 Canal Sunrise, a/c, 40" x 40"
Autumn Afternoon on the Canal, a/c, 24" x 30"
Summer Leaves, a/c, 8" x 6"
Overgrown Path, a/c, 12" x 16"